Data Loss Prevention (DLP) describes a plan for companies to control the sending of sensitive data. E.g. this can include controls to stop the flow of sensitive data or to ensure that sensitive data is always well-encrypted (for compliance) when sent. Construct a list of words, phrases, or patterns that, if they are present in an email, signify an email message that may contain sensitive information. This classic DLP system is available through many email providers and has been available at LuxSci for many years as well. However, it does have a glaring limitation — no matter how complete and complex your DLP pattern list is, it is almost certain that some messages containing sensitive information will not quite match (or the information will be embedded in attachments that can’t be searched properly). If they do not match, then they will escape in a way that may be considered a breach. For example, consider a medical organization whose communications fall under the umbrella of HIPAA. With HIPAA, messages that contain sensitive information (ePHI) must be encrypted in transit from the sender to the recipient (of course — they must also only go to appropriate recipients… but that is a separate issue) and it is best if they can also be encrypted at rest. Organizations seeking HIPAA compliance for email often “solve” this requirement by (a) allowing senders to manually “opt in” to encryption for sensitive messages and (b) setting up DLP lists to also automatically encrypt messages that seem to contain ePHI, but which the sender didn’t select encryption. Unfortunately, if a message with ePHI doesn’t match your DLP list and is not actively “tagged” by the sender for encryption, then that message can go out insecurely and that is an automatic breach of HIPAA. In the same way that standard “opt in” email encryption is too risky for compliance, relying on a DLP list to trigger encryption is also very risky. The problem for DLP via encryption is the same as the problem with standard “opt in” email encryption. The choice is only between encryption vs no encryption (or encryption vs opportunistic/hopeful encryption). At LuxSci, we believe that the solution should instead be between strong encryption and a basic level of standard encryption (e.g. enforced TLS Only). That means that every message will be encrypted, at least with TLS (and for those unfortunate few recipients whose email providers still do not support TLS, another method will be used – Escrow). Messages that are suspected of containing ePHI based on the fact that they match your DLP list will be encrypted using stronger encryption (PGP, S/MIME, or Escrow) which provides both transport and at rest encryption … AND will also be transmitted using TLS if possible. From this arrangement, you get excellent protection for all sensitive messages. You also get a basic but acceptable level of protection for all other messages … including messages that are ePHI but which fell through the cracks. It means that your risk of breach is significantly reduced with minimal impact on the usability of your secure email system. This can be combined with LuxSci’s next generation “Opt In” email encryption — where senders can include custom text in the message subject to similarly disable the simple “TLS Only” encryption option on a per-message basis. Move on from the risk of the old way of Data Loss Prevention to LuxSci’s next generation method of “encrypt everything — but encrypt sensitive information more”. Secure: Does LuxSci Hold the Keys to Unlock your Secure Email Data? 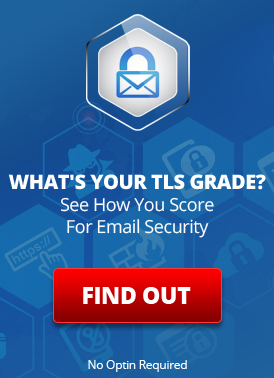 Are you Minimizing your Risk by using the Next Generation of Opt In Email Encryption? SMTP TLS vs Secure Message Pick Up: Which is Better for HIPAA? This entry was posted on Tuesday, September 29th, 2015 at 10:12 am	and is filed under LuxSci Library: HIPAA, LuxSci Library: Security and Privacy. You can skip to the end and leave a response. Pinging is currently not allowed.